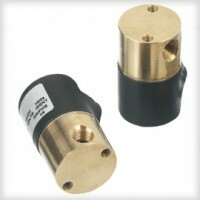 The C Series miniature solenoid valve, available only in brass, is a highy durable miniature 2- or 3-way direct acting valve for applications that require a higher flow control. The C Series also utilizes a larger diameter body and larger port connections for higher CV valve rates. The free machining brass body allows for fast and precise machining, translating into lower product costs as compared to stainless steel. Design engineers appreciate the quality inherent in solid brass components.